For the ultimate in footwear protection, the Tactical Research TR998Z WP CT Chrome Waterproof Side Zip Composite Toe 8in Boot was designed to meet all of the performance, protection, and tactical needs of the law enforcement professional. This boot features lightweight construction and a Gore Tex waterproof bootie to shield your feet from standing water or rain. Newly introducted to Tactical Research's footwear line is stitchless technology called "Hot Fusion" which uses a composite exoskeleton to further reduce weight weight & increase durability. A side zipper makes putting these on a cinch while a velcro tab keeper maintains a low profile to avoid getting caught on objects. A low weight composite toe meets all ASTM standards for crushing protection when falling foot dangers are present. 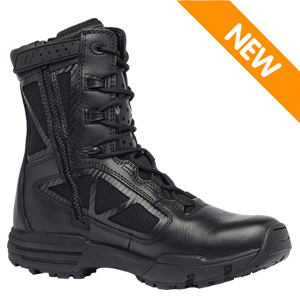 All of these features make the Tactical Research TR998Z WP CT one of the most versatile tactical boots on the market today. Tactical Research Gore-Tex boots run 1/2 size smaller than your normal running or athletic shoe size. If you wear a size 10 running shoe, consider ordering a size 10.5.